Today I'm sharing a recap of my exciting summer staycation here in sunny St. Pete, Florida. 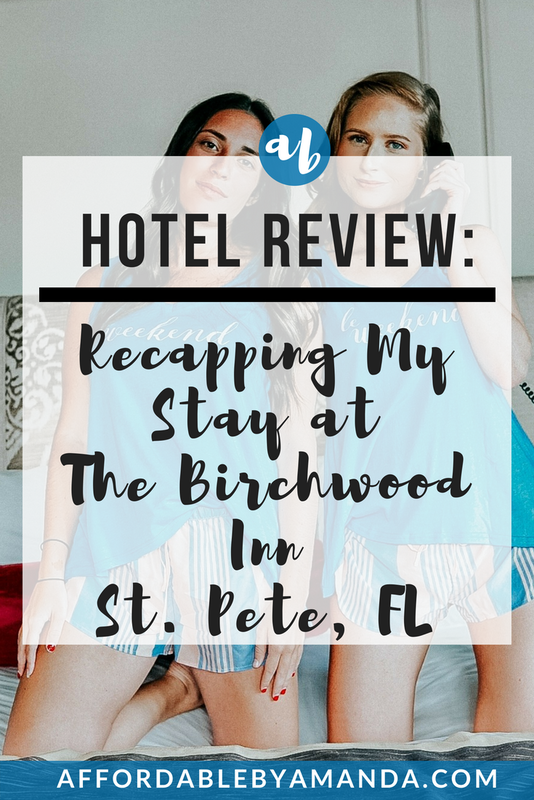 This weekend I was lucky enough to have a stay at The Birchwood Inn located on Beach Drive in St. Petersburg, Florida for one night. I'm going to detail my stay and what I enjoyed at The Birchwood Inn. If you are in need of staying at a hotel in the area you can see if The Birchwood is right for you! One of the best perks of The Birchwood Inn would have to be its insane location. Upon checking into the hotel on Saturday night, my friend Madison and I were considering our options for dinner. We could have either stayed behind and enjoyed a meal at the hotel, or we could have explored downtown to see where else looked delicious. As a St. Pete native, I am familiar with a lot of the best restaurants along Beach Drive, but it was a busy Saturday night, so we chose to walk over to our favorite Thai restaurant called Sab. We also ordered ahead on the phone so our food would be ready by the time we took our 10-minute walk to the restaurant. It was so easy to leave the Inn and walk along Beach Drive until we made it over to Sab. Another awesome perk about The Birchwood Inn is the valet parking. For the night it's $18 to valet your car in their parking garage. The parking options in downtown are not the best. It's really difficult to park your car for more than two hours at a time. You can also use the meters to park your car close by, but that would cost you so much money. The valet parking works out great because you can safely keep your car in the garage for the weekend if you want. As I mentioned before, the hotel is situated in a prime location along Beach Drive. You honestly don't need to use your car unless you want to venture out away from downtown and head toward the beach! Walking downtown or taking an Uber is ideal in this part of the city. The room we were given was so regal! We stayed in the Premium King Room with a gorgeous City View. It had a huge king sized bed covered with tons of fluffy pillows. The hot pink accent chairs were just what we needed to sit and enjoy our Thai food. When we entered the room, we dropped our belongings along the side of the room so they were out of the way. A complimentary bottle of Voss water was waiting for us to split, too. Another amazing feature of our room was the Juliet balcony. Our view of the city was breathtaking! I could imagine staying here for New Year's Eve. It was one of the only two rooms with a balcony and I spent quite some time soaking up some sun while waving out to the people down below. The only pitfall for our room was the lack of a mini fridge! I purchased some beverages for us to enjoy and I wished there was a fridge to store them in. 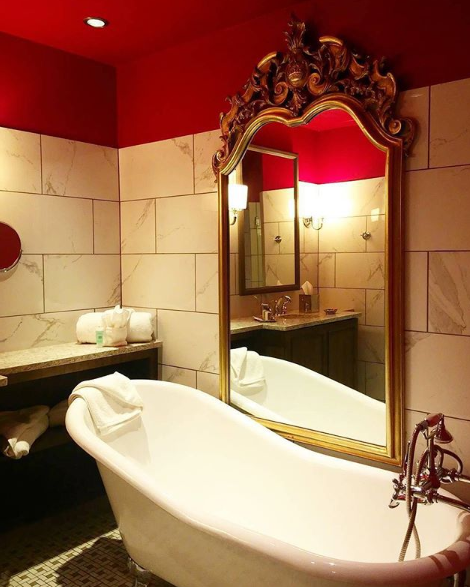 The 20s theme of our room included a claw foot bathtub in the bathroom. A huge radiant gold mirror hangs on the bathroom wall, too. 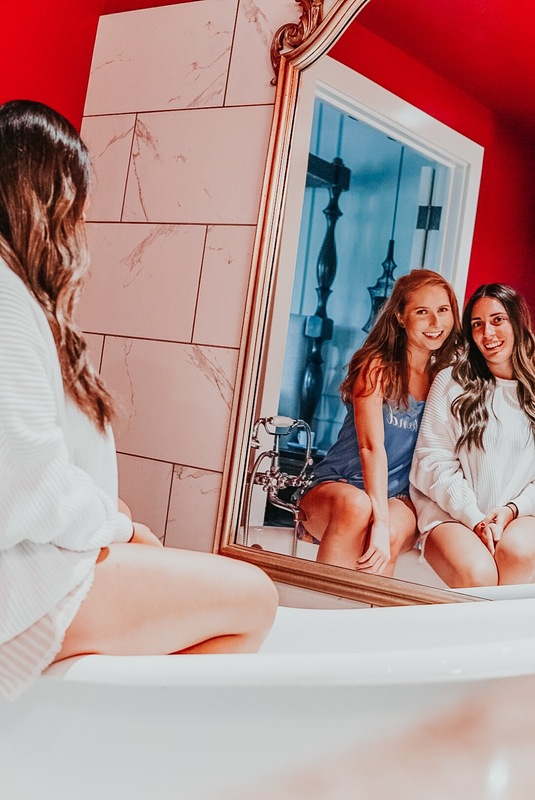 The claw foot bathtub was such a fun place for us to capture some photos! Unfortunately, I left my bath bombs at home or else we definitely would have taken advantage of this focal point of the bathroom. Next time! Did you know that The Birchwood Inn has its own rooftop bar? The Canopy is located at the top of the hotel! You can hang out here if you are visiting for the day or you can leave your room and take the exterior elevator to grab some lunch. At night you must be 21+ to enjoy the drinks up at the exclusive rooftop bar. Maddie and I got dressed up in some sassy satin dresses and went up to the roof with two of our friends to see the nighttime view. The Canopy also has cabanas you can rent for the evening with your friends. The cabana options are available from 4:00 pm until midnight for different prices. In the morning after a late night out on the town (lol), Maddie and I remembered the front desk informing us about the FREE BREAKFAST offered until 10 am! We woke up and I put on my glasses so we could walk out to the elevator and quickly find some food. I am the type of person who needs breakfast as soon as I wake up so this free breakfast deal could not be any more perfect for me! I headed straight for a cup of hot green tea as soon as we walked out of the elevator. The breakfast options were set out in front of us and I chose a plain bagel, strawberry yogurt, french toast, and a blueberry scone. 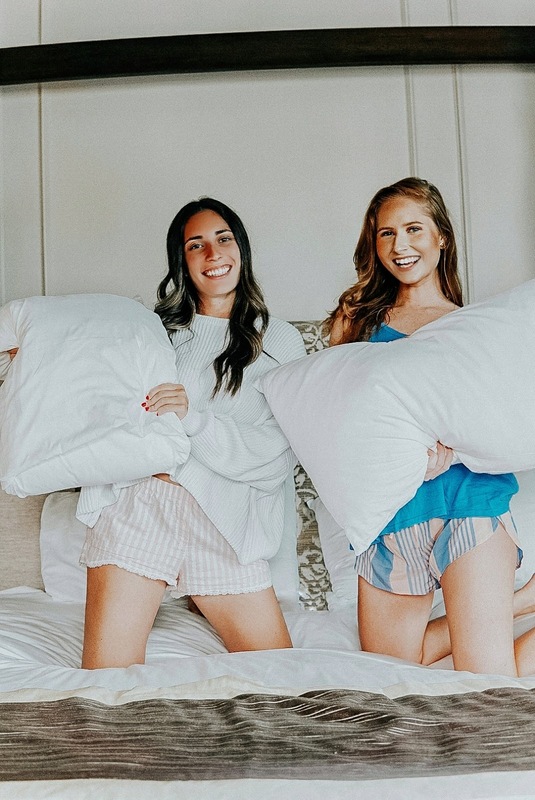 If you are planning on staying in St. Pete you do have SO many amazing options. As for The Birchwood Inn, I highly recommend you book a reservation at this hotel because of its prime location and access to the best restaurants in the city. The staff is SO kind and helpful and will take care of you in many ways! For example, we forgot to bring scissors and a bottle opener so we easily made a call down to the front desk and our problems were solved in minutes.